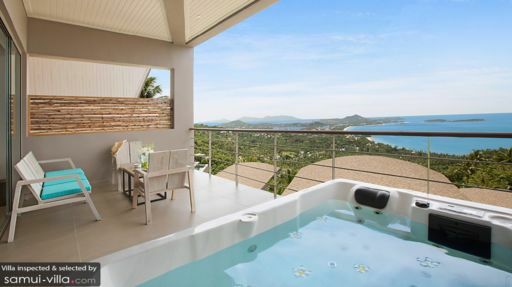 A stunning location right above the beaches and ocean in Koh Samui, Penthouse Poda is a two-bedroom luxury apartment with a private Jacuzzi on the terrace. The gorgeous interiors are contemporary in aesthetic adding an opulence like no other. 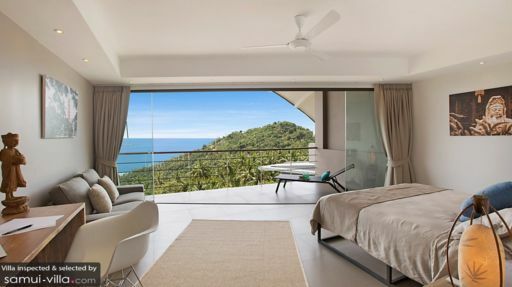 The penthouse is part of Comoon Samui, a luxury complex with five villas and a penthouse. The penthouse is conveniently located close to Chaweng beach, so guests can head out and explore the neighbouring areas without a problem! Crisp, modern aesthetic finds its way into the two bedrooms at Poda, each with its unique design and stylistics. There is a king-sized bed in the master bedroom and single beds in the second bedroom. The master room adjoins to a private terrace which houses two lounge chairs for guests to rest on. The air-conditioned bedrooms are perfect for a good night’s rest which is aided by the quality bedding and serene ambiance. There are en-suite bathrooms for each of these rooms fitted with showers and other amenities. It even provides a work desk as well as comfy, plush couch in the bedroom. Offering elegant and classy interiors the splendid Penthouse Poda prides itself in offering a terrace which has been fitted with a couple’s Jacuzzi for a good lounging session as you embrace the tropical ambiance. There is the spectacular ocean lying as far as the eyes can see encircled by the greenest of natural foliage that stretches across vast acres of land. There are other islands that can be spotted from the terrace as well. 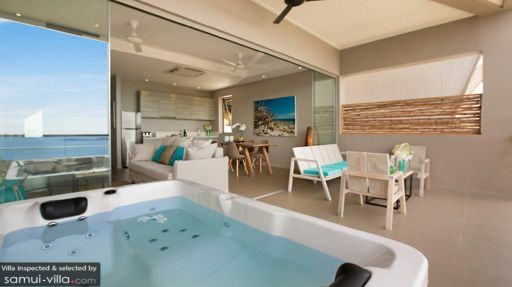 Right beside the Jacuzzi, there is a wooden, outdoor seating with rustic chairs upholstered in an aquamarine colour to add to the island vibe. The interiors at the penthouse sport an elegant beige, white, and gold colour scheme specked with bursts of blue! The beautifully-decorated open-plan living area reaches out to the deck through glass doors, that also doubles as a screen beyond which lies the ocean. Rest up and lie back on the plush, cream-coloured couches as you watch a film or two on Netflix-supported Smart HD TV, perfect binging on your favourite TV shows. The pristine interiors bring about a luxe ambiance and a comfortable atmosphere for an easygoing living. Towards the corner you will also find the dining area with a four-seater dining table and comfortable chairs that also provide a nice spot for some sightseeing! The warm tones in the living and dining area will help you settle in with much ease so you can get right to your holidaying without a delay. There is even a fully-equipped kitchen in the living room which has everything from a refrigerator to a luxe coffee machine for your daily morning fix. Excellent amenities are part and parcel of a stay at any of Comoon’s villa and the penthouse is no exception as it gives you ample services that are nothing short of luxurious. You can request for a personal chef, skilled in Thai and other cuisines, and leave all your meal preparation to them. The villa manager is well-equipped and skilled to oversee the smooth functioning of the villa. Comoon provides its own fitness centre for the use of guests apart from offering yoga sessions, massages, and Muay Thai classes. Penthouse Poda and the rest of the villas at Comoon are excellently situated near Chaweng beach, which is world-renowned for its active and exciting nightlife with many beach clubs and bars in the area. There are night markets one can explore as you can find many local fares and delicious street food as well. Intrinsic to Samui are the many water activities that you can engage in like snorkelling, jet skiing, sailing, etc.